I am part of the team that is searching for the world's best high-tech startups. We're looking in very specific areas for the Startupbootcamp HightechXL program which is currently open for applicants. As part of the preparation, we've been looking at what's happening in startups that are interested in robotics. And there we discovered that small companies in Europe are doing a huge amount of pioneering work. Through Heico Sandee, who was actively involved in the recent Robocup contest in Eindhoven, we discovered a range of interesting companies. Like Clear Flight Solutions, a startup in Enschede in the East of the Netherlands. They build remotely piloted robotic birds which they call Robirds. They have the very realistic appearance of a Peregrine Falcon and a Bald Eagle. This unique invention uses flapping wing flight as a means of propulsion. Robirds not only resemble real birds of prey in appearance, but also in weight, flapping wing flight profile and flight performance. Robirds turn out to be very suitable for controlling nuisance birds. Think of the problems that birds can cause near airports and the amount of money that is currently put into installing electronic devices to scare them away. 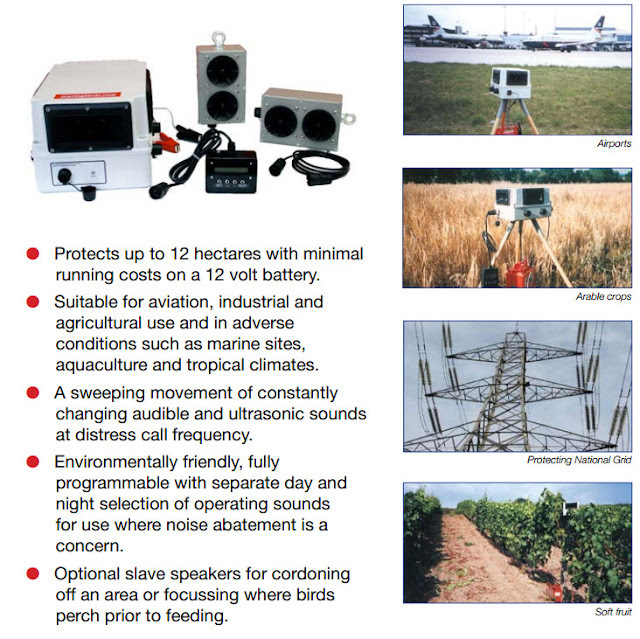 Conventional bird scaring equipment looks like this: They use sound to scare the birds away. The silhouette combined with the characteristic wing movement of the Robirds trigger the inbuilt instinct in pest birds to fly up, flock together and try to out climb the Robird in exactly the same way they do when confronted with the predator the Robird represents. After flocking the operator can now herd the pest birds in the desired direction out of harm’s way, without habituation and with a lasting effect. By imitating nature so closely, Robirds are extremely effective in herding birds, whereas most other currently used measures only randomly scare pest birds which then will scatter, with high risk of coming back to cause trouble again. Real birds using strong muscles for the down stroke. During this move the wing produces lift and thrust. They don't have strong muscles for the upstroke so the wing doesn't produce thrust during that move. The wing also bends vertically between hand and arm part during the upstroke as the Robird does it a bit to. ( wing articulation). During the stroke cycle a wing twists by changing the position of the hand. In compare to real birds the Robird powers the wing even during the upstroke. Thrust is still generating! That's why the Robird can fly faster than his natural competitors. The outcome of scientific wind tunnel tests of a fixed Robird wing is that this wing produces 41% more lift than any other wing ever made! Amazing stuff don't you agree? Even more amazing when you compare this robot with the wildlife documentary the BBC did about the Peregrine Falcon. Just compare the motions.